Turns out that you can stack villain escape with a TV wizard mode. With both WMs qualified it will start villain escape first, then hit the saucer again to start the TV WM. I managed to do it with Mr Freeze’s power running so that the villain escape timer was frozen the whole time and built up ~12M villain value by the time I left holy multiball. All said and done I scored 1.2B in villain escape without even reaching the SJP. Kinda sad I didn’t hit that super at least once. I pulled this off the other day and was very confused as to what was going on until it was all over. Had Mister Freeze going and came out if it with 25bil. Been trying to stack it up again with the knowledge I have now, but, have failed utterly. Had Mister Freeze going and came out if it with 25bil. That was 25bil and change for the whole game. The majority of the score did come from the stacked wizard modes. After I had all the shots multiplied the mystery award kept giving me playfield multipliers. Not sure what my playfield X got up to (I was too busy scoring points) but, it was probably around 7X. Hurry-up starts at 5 million and increases 250k for every collection. Mr. Freeze’s award prevents this value from counting down. The SJP value is the sum of all Hurry-ups collected (before shot/playfield/channel multipliers). just a tip on how to use the gadget button when launching a ball in order to get a lock: after you plunge, hit the button as soon as it turns yellow. haven’t figured out the timing for the mystery saucer. I hate to say it, but this rulesheet needs an even bigger post limit. I tried to make just a few of hamdrewburglar’s edits and couldn’t even do that. I had a draft with all the new info and went ahead and updated the wiki after gdd upped the post limit for us (again) This is quite the detailed rulesheet! Investigated Villain Escape stacking rules. Villain Escape and TV Mode may both be lit. Lighting TV Wizard Multiball BEFORE lighting Villain Escape, only TV Wizard MB will start; Villain Escape will remain lit and may only be started after returning to single ball play. Shooting the saucer first prompts you to select your TV Villain. If you select Shame (and it is a MB) you will play the Shame MB but Villain Escape will not start. It will stay lit and may be started once you return to single ball play. If you select a TV Villain whose completion might light a TV Villain Wizard Mode Multiball, and then complete the TV Villain while still in Phase 1 (Mr Freeze’s award is very helpful here, but not technically required), then the saucer will light for TV Wizard MB, and one may be selected, and this will run concurrently with Villain Escape. After playing TVWMB and returning to one ball, Villain Escape will continue to be running in phase 1. However, after all that, this isn’t as lucrative as it sounds, regarding Villain Escape scores. Stacking a TV Wizard Multiball with Villain Escape phase 1 “confuses” the turntable and it will be permanently turned to the Atomic Pile even if Gas Attack is selected. Thanks for your edit work! great to have others digging deep in this game! I do have to disagree with your edit to Mr Freeze though. "(Gadgets will always complete a red shot if any are lit, before advancing any blue shots)" I’ve tested this before and did just now to make sure. Gadget behavior (see section 10. under gadget logic) is the same as always in this mode, being that gadgets hit the shot furthest to the left. In the case of Mr Freeze it will turn the left orbit from red to blue then a second gadget will ‘hit’ the blue shot, then the same with the left ramp. So 6 gadgets can immediately take down wave 1 of Mr. Freeze. So he actually is fully susceptible to gadgets but it takes at least 11 of them. my bad :-/ good catch! What is the easiest season 3 villain to complete? If I’m playing well and have Bookworm and Mr. Freeze out of the way I’m looking for a season 3 villain to closeout for TV wizard mode but haven’t come up with a good one yet. Probably because I go with season 3 Shame a lot for the multiball, but usually fail to close it out. I usually do the first S3 Tut, (The Unkindest Tut Of All) sometimes egghead (The Ogg Couple) Either one isn’t too hard to complete, much easier than the 15 shots for Shame. 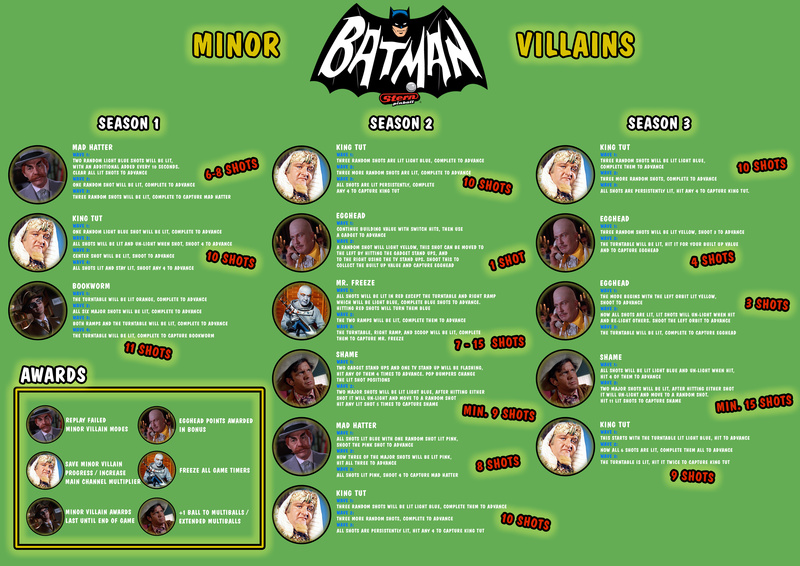 this rulesheet is so helpful, i condensed all the infos regarding minor villains in a graphical cheat sheet i stuck next to my machine. I find it really helpful as i’m really bad at remembering all the needed shots for every villain. I noticed an interesting exploit in Villain Multiball last night while watching the Stern Pro Circuit stream. I added the following text to the VM rules section. I forget who was playing while this happened, but it seemed like a huge advantage when the machine was set to such short ball save times. See: every stern with the new display except Iron Maiden. Batman 66 is the least problematic game with it; Aerosmith and Guardians of the Galaxy trigger severe exploits and are at the top of the list (disable toybox and Groot! ), while Munsters is hilariously flawed due to Super Jackpot chains existing. The notes for the 1.03 update state that Mr Freeze will now prioritize “blue shots” from gadgets, but this does not appear to be the case in implementation. However, his new sound effects are more than awesome enough to make up for this oversight. Also I thought that Bookworm was supposed to hold Egghead bonus from ball to ball, but I did not notice this effect. The improved display optimization is delightful (you can always see your scores on top of everything else). The mr. Freeze gadget change was the first thing i looked into and i agree, it doesn’t do what it says in the notes… I also noticed that the penguin scoop now lets you qualify it while someone else is already qualified, strange that it would be changed back so soon. I haven’t looked into anything else really, I’m guessing there’ll be a bug fix update soon enough.